Protein water is a type of functional water, involving dairy-based and non-dairy-based sources, such as whey, soy, pea, etc. It is a refreshing, low-calorie, and high-protein drink that is preferred over other available types of water, such as sparkling and mineral water. Health supplements are widely popular across developed markets, due to their improved functionality, which, in turn, is likely to drive the growth of the protein water market over the forecast period of 2017-2023. The growing importance of protein-rich diet for lean muscle growth and repair, is the primary driving factor for the protein water market. Endurance and strength are the main functionalities that are derived from the consumption of protein water. Refreshing fruit flavors along with natural colors, flavors, and sweeteners for protein water, are expected to bolster the demand for the market, over the forecast period. Ready-to-drink products are gaining popularity, owing to their ease of consumption and nutrient content. Rise of vegan population has also led to the introduction of plant-based protein products, such as soy and pea, which is expected to influence the growth of the market over the forecast period. Owing to the growing demand of protein water from athletes, driven by rise in investment for sports nutrition, there is a significant growth potential for the protein water market. The market has been segmented by product type, distribution channel, and end user. By product type, the market has been segmented into dairy-based and non-dairy-based protein water. Non-dairy-based protein water is gaining prominence among consumers, due to an upsurge in the demand for protein water from the vegan population. On the basis of distribution channel, the market has been segregated into mass merchandisers, specialist retail stores, online channels, and other distribution channels. By end user, the protein water market has been segmented into core users, lifestyle users, and casual users. The powder segment is gaining popularity among lifestyle users, owing to its convenience of consumption. Extension of E-commerce channels has facilitated the popularity of these products, due to considerable amount of investment in branding and advertising. The fresh fruit flavors, such as orange, kiwi, strawberry, and coconut infused with protein water, is one of the crucial factors driving the growth of online channel over the forecast period. Protein water is increasingly becoming a major source of vital micro-ingredients in a desirable and convenient manner, which is an important factor for the expansion of the market in Europe. The increasing popularity for plant-based protein water products is one of the driving factors for the rise in the demand of these products in North America. The rise in spending for health and wellness is one of the crucial factor influencing the growth of the protein water market in this region. 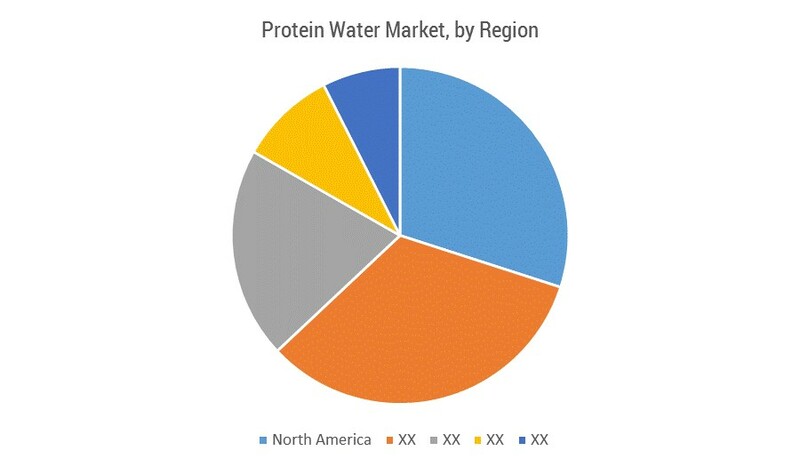 The considerable presence of global players catering to the protein water market is a driving factor for the growth of the market in the United States. The presence of young population in the developing countries of Asia-Pacific, such as China and India, among others, is expected to generate a high scope of development for the protein water market over the forecast period. The major players operating in protein water market are - Kellogg Company, Arla Foods, Optimum Nutrition, and Cend Limited, amongst others. November 2017: BiPro USA introduced on-the-go gluten-free and lactose-free clean label protein water solutions, including two flavors- Peach Power and Lemon Lift, which have zero grams of fat, carbohydrate, and sugar. June 2017: Arla Foods launched whey protein-based protein water, formulated with Lacprodan DI-9213, a natural whey protein isolate that is neutral in taste, which will facilitate post-exercise recovery. Understanding the market dynamics, which essentially consider the factors that impel the present market scenario, along with growth opportunities of the market over the forecast period. Market segmentation analysis including qualitative and quantitative research, incorporating the impact of economic and non-economic aspects. Regional- and country-level analysis, integrating the demand and supply forces that are influencing the growth of the market.